This fabulous Double Chocolate Cheesecake dessert recipe tastes so good it should be illegal. But it will only be that good if you use quality chocolate so use the best you can afford. 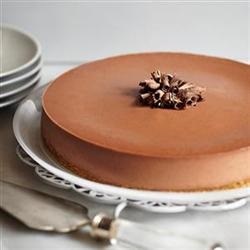 This cheesecake can be made up to two days in advance of serving. It is great for a dinner party. Just cover the pan after it has chilled for a few hours. It will also be easier to cut and serve if it is removed from the refrigerator about an hour before needed. Offer a sparkling wine with the cheesecake and your dinner guests will never forget the dessert or the experience. Enjoy your Double Chocolate Cheesecake and the company of those you share it with! Did you know? An ancient form of cheesecake may have been a popular dish in ancient Greece even prior to Romans' adoption of it with the conquest of Greece. The earliest attested mention of a cheesecake is by a Greek physician who wrote a book on the art of making cheesecakes. The earliest cheesecake recipe (1390) was found in an English cookbook from 1390.